Ask fellow campers about "Silver Creek RV Park" and nearby attractions. Stayed from 1/1/18 to 8/1/18. Its a nice roomy park. Lots of gravel and dust. Lots of gun fire from the neighbors. We never had any theft or crime issues. Entry driveway is very poor. Water pressure and sanitary sewer very good. ATT cell phone very good. Trash collection very good. No flooding. No grass or landscaping. some road noise from 199 to the north. We camped at Silver Creek RV Park in a Fifth Wheel. 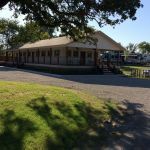 Are you affiliated with Silver Creek RV Park ?